Dr. Priyank Garg is a renowned Ophthalmologist in Khila Road, Meerut. He has helped numerous patients in his 17 years of experience as a Ophthalmologist. He studied and completed MBBS, MD Opthalmology, FICO, FAICO, FVRS, FNB. He is currently practising at Drishti Eye Foundation in Khila Road, Meerut. Don?t wait in a queue, book an instant appointment online with Dr. Priyank Garg on Lybrate.com. Lybrate.com has a number of highly qualified Ophthalmologists in India. You will find Ophthalmologists with more than 38 years of experience on Lybrate.com. Find the best Ophthalmologists online in Meerut. View the profile of medical specialists and their reviews from other patients to make an informed decision. Please check your diet and routine. Mild to moderate depression due to certain ppl or situations in life can also typically bring in such complaints. So please take care and become more aware of what's to be done. By consulting a good doctor. Will the bulging of retina be cured after Avastin injection and laser treatment ? It is not bulging. It is called as edema. Avastin and laser will definitely help but if your sugar levels are not under strict control then no measures in the world will help you. Keep your sugar levels under strict control no matter what. Doctor am having headache daily. Pain comes on top of he head and forehead. Painkiller aand a deep sleep is only the only way to recover from this. Eye have smal pain in the eyes also. Pls help me. I need to understand more about this problem. I have squint. I seek remedy without surgery such as glass to cover it from others what I should do? First of all it is important to assess the degree of squint. Squint upto even 20 -30 prism dioptres can be corrected with prismatic glasses most of the times. But before deciding on that you need complete squint evaluation. I got to know that I am having keratoconus in my eyes at the age of 13 we were recommended to move for c3r surgery to stop the progression .But as my age goes on increasing I faced many problem like double vision and blueness. Now I am 19 years old doing engineering with cse bring facing much problem in sitting front of computer and multiple vision and blurnss. What to do next. As blueness is increasing as age progressing. please help. Dear you are suffering from keratoconus. There r three options, to improve vision in this eye like speck, contact lens & refractive corneal surgery. You may choose options according to your profession. I have red eyes what to do I am sick of pain help me doctor help me my eyes are paining. I am suffering from allergy conjunctivitis almost 2 years. Sometime this discontinue. When problem is rise then I am using this medicine IF2 eye drop (olopatadine hydrochloride) and genteal lubricant eye drop. Sometime I am used montair lc tab (montelukast sodium and levocetirizine hydrochloride. When these are medicine used then my problem disappear. When I expose to sunlight, dust, smell, smoke then once again appear this symptoms like puffy eye, pain in eye. Red and etching eye and nose. I am extremely trouble for this symptom because again and again comeback. My face swelling at morning time. Please sir tell me any new way. Thank you. 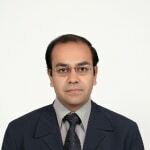 I’m Dr. Harshavardhan Ghorpade from the department of visual sciences DOVS from Fortis hospital Vashi, Mumbai and Saroj Speciality Eye Clinic Vashi, New Mumbai. I have done my MS. FRCS and I m a cataract, cornea and a refractive eye surgeon practicing here in New Mumbai. You can get back to me on lybrate.com and know more about me. Today I’m going to talk to you about very interesting topic about recent advances in corneal surgeries. Now first of all let me start by telling you what is cornea. The Cornea is the front surface of the eye, the black thing you see at the center of the eye. It is actually very transparent and the black color comes from behind i.e. from the iris. This transparent structure is responsible for most of our vision. The other organ or other part which is responsible for most of our vision is the lens that lies behind the iris. So the cornea helps us to focus light on the retina which then transmits it to the brain. If this cornea is opaque then the light will not be transmitted and you will not see clearly. As a result of which we need to do something about it and the most important thing is to do is to replace the cornea with another cornea which comes from a donor and, therefore, donation of eyes after death is a very important act because you helped the next person who is blind to see again. But you should remember that while doing a corneal surgery we only replacing the front part of the eye and not the entire eye. So, now talking about the recent advances corneal surgery we thought that only one cornea could be used per person but today we are doing microsurgery in the cornea as well we are dissenting the cornea into multiple parts and therefore one single eye can help three other eyes. How is that? So, we have three parts of the cornea: the front, the middle and the back. The front part is called Epithelium the middle is Trauma and the inner is Endothelium. Periphery to these are stem cells which are called as limbal stem cells. Now if you have one donation we can dissect the cornea into the front and the back part. The back part can be use for replacing the back part of a damaged cornea and this called as DSEK Descemet Stripping Endothelial Keratoplasty which is a surgery where the inner part is replaced. In other cases where you have the front part involved where there is opacity because of say infection then we removed only the front part of the cornea and it is called as DALK Deep Anterior Lamellar Keratoplasty where we use only the front part of the donated cornea and then use the back part to some other person. Now the third part of the cornea is the Limbal stem cells, these limbal stem cells are responsible for growing a new layer on the cornea. however if they are damaged e.g. in acid injuries or alkali injuries or any other chemical injury then they don’t grow and this front part of the cornea gets completely opaque now we need to replace these stem cells from where do we get them. We get them from the other eye if it is normal or we can take it from a donor may be a relative or a dead person. Once you get these stem cells they can then be implanted into the eye which called as stem cell transplant and then they grow back on the surface leading to clear and very crystal clear front surface of the eye. These stem cells are very much important for overall health of the cornea. So as I have discussed the various advances i have now helped us to donate cornea and makes you full use of it for three different persons; the front part, the back part and the stem cells. So what are you waiting for? Go to the eye bank and get yourself registered for eye donation and remember eye donation can only be made after death so you don’t have to worry. After that you make other person see and you will also see the world through them. I Have myopia of -2.0 .could it possible to recover from it. Any exercise or medicine. It first occur on 2002. Also my eye sometimes have a high problem. Please give your valuable suggestion. I have red eyes from last three days. And it is pained from last three day. I have also stomach problem. It is paid when I eat some fast food. I have also number of farts. My sister have also problem in mouth. When she is eat some hot foods. My mother is handicap and my father is also handicapped. They cannot walk by their own legs.